Ride alongside one another. Through life, on bikes, together. Teetering on the edge of wiping out in nearly every frame of this film, these freeriders push the limits of their Rocky Mountain Blizzard fatbikes. Deep powder, steep chutes, good sized drops, and a dirt jump session complete with backflips and 360s kept me entertained for the entire 3 minutes and 4 seconds. Marin celebrates its 30 year anniversary with a new bike that harkens back to the classic, well-liked model it shares its name with, the Pine Mountain. 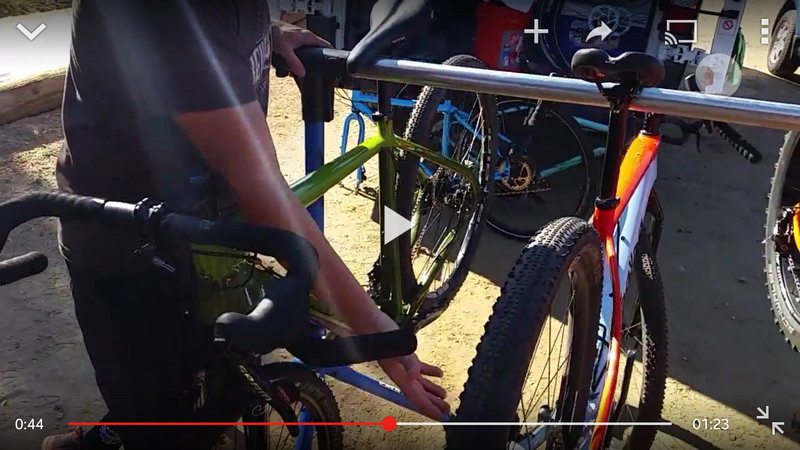 In the video below, we take a look at the 2016 Marin Pine Mountain 2. The Pine Mountain 2 has upgraded build specs and frame construction (compared to the Pine Mounatin 1) that we took a close look at. Not only did we discuss those build specs and frame construction choices made by Marin, but also the possible applications for this 27.5 plus hardtail trail bike. When looking at the Marin Pine Mountain 2, there were many things I immediately liked and/or was intrigued with. The first was the frame construction. Columbus CrMo steel catches my attention right away. I have been a huge fan of steel hardtails ever since my first singlespeed 29er. The modern steel frames can be drawn, butted, and formed very precisely yielding a frame that has ride quality and rigidity in just the right places for a great balance of efficiency and comfort. This frame is unique in that it has really cool, high quality, yet understated graphics and design elements. The 30th anniversary emblem on the seat tube looks phenomenal. The raw, clear-coated frame with brazing showing through makes this frame look completely custom and has an industrial feel. As I looked at the brazing, I noticed this steel frame has cable routing through the frame. For a steel frame this is almost unheard of. Mad props to Marin for including this. It isn’t entirely necessary, but isappreciated as it makes this bike look clean, high quality, and if you didn’t know better, a one-off piece that was custom ordered. Secondly, was the plus sized wheels and tires. While WTB Trailblazers are on the narrow end of the plus bike tread options, they roll quick and add volume that is noticeable. The WTB Scraper rims, with their 45mm inner width, allow a wide profile and will be a good foundation for any other tires you may decide to use in the future. Thirdly, the rack and fender mounts on the frame are definitely a rarity on a trail bike like this. In my opinion, its better to have them and not need them, should you only use this bike in drier conditions for a general trail bike instead of loading it up or outfitting it with fenders. Like the adage goes, “Its better to have them and not need them, then not have them and wish you had them.” I imagine other frames like this, capable of general trail riding with higher volume tires and a little more comfortable geometry, will start incorporating features that cater to bikepacking, longer rides, and carrying more gear as overnight trips by bike continue to grow in popularity. Fourth, I noticed the HUGE amount of clearance on the Fox Float 34 fork. This thing could probably come close to clearing an actual fat bike tire. It appears that tires close to 4 inches wide may fit. 29 plus tires should fit no problem, so I imagine just about any 27.5 plus tire could fit up there. That is a great plus. Pun intended. Fifth, the dropper post. This was very intriguing. While I have yet to use a dropper post on a bikepacking trip, I have used them on trail rides and they are undoubtedly a huge benefit. This is the first time I can recall seeing a bike come factory spec’d with both a dropper post and rack mounts on the frame. I quickly wondered why. Why haven’t I seen this combination before and why did Marin include both. Both of my two hypotheses hinged on the assumption that because Marin wanted to make this a trail bike (Marin calls it “Trail+”), they included a dropper post. That seems reasonable. My first hypothesis is that in order to utilize a dropper post while bikepacking, the larger seat bags that are so common and often necessary for carrying sleeping bags, tents, clothing, or other bulky items would not be possible. Since the large seat bag wouldn’t be used when using the dropper, rack mounts would provide the opportunity to carry that necessary volume on a rear rack. The second hypothesis is that Marin figured most of the time, trail riders would prefer to have a dropper post, so they included it in the build, but they knew that the plus-size platform, with the trail geometry and steel frame would attract many riders would see this bike as one that can fulfill two roles: trail riding and bikepacking/all terrain touring. If riders plan to trail ride most days, but occasionally use it for an overnight bike trip, it would be easy to either swap out the seat post and use a large seat bag, or mount a rack and bags to carry their gear. I think its a good call and may be ahead of its time in a trend that may start in the future as we see more riders using their bikes to explore and spend nights in the backcountry. Subscribe to get more of our content sent to your inbox! Ride alongside one another. On bikes, through life, together. This is Episode 6 in an ongoing series of videos we will be posting regularly to share our mountain biking tips and tricks with our subscribers. Back in the early 2000’s, I purchased an aluminum-framed mountain bike with front suspension. With the mountain bike, I was offered 10% off any additional accessories at the time of purchase. After picking out a helmet, pump, patches, spare tube, tire levers, and multitool, I looked over the bike wondering what else I was missing. I saw water bottle mounts and instantly headed toward the water bottle cages. After picking up two, I began looking over the water bottles. The salesman came back to me and said he would throw in a couple water bottles for free if I was okay with them having the shop logo and contact info on them. I said of course, but then I was surprised as he led me toward some small backpacks that he began telling me about. He had started using these packs to carry all the water he needed for his ride, as well as all his trail-side repair tools and supplies. It had a hose and a bite valve that were up by your chest where they were less likely to get covered in dirt and more likely to keep you well hydrated without the fear of losing your bottle while riding. I loved the concept and was sold. I used a Camelbak for a decade straight without even thinking about going back to waterbottles ever again. In fact, with each new mountain bike I purchased, I scoffed at the water bottle mounts on the frame as I thought they were archaic and antiquated since the invention of the Camelbak. I was a huge fan. Then I started seeing how far I could go in a single ride and entered endurance XC races. I quickly realized that having water mounted to my bike felt much better than on my back for any rides over 20 miles or a couple hours. I started using water bottle cages and water bottles again while using a small seat bag to carry my other items that had previously went into the Camelbak. I mounted up to 5 water bottles on my bike at a time to allow me to go into areas without opportunities to refill, all while keeping my back free from the weight that would be too great of a burden to bear over the extended hours of longer rides. Then bikepacking bags entered my world. Sure, water bottle cages with a small seat bag are what I often choose to use for smaller, local loop rides, but more often these days, I find myself leaving my frame bag on the bike. Why? Get as much weight as low as possible. Putting the heavier items that need to be carried (such as a multitool, spare tube, and water in a hydration bladder) as low as possible on the bike, close to the bottom bracket, gets the center of gravity lower. This in turn enables easier maneuvering of the bicycle when moving the bike side to side than it would if the weight was carried higher up. Think of your bike like a lever. It is moved left to right and right to left as you lean and turn it, the tires, where they contact the ground are the pivot points. Getting the weight as close to the ground enables easier side to side transfer into turns. Comfort. If you have had a heavy backpack on for any length of time, you have realized how fatigued you can get in a very short amount of time. Keeping the weight of your water and other items off your back allows you to stay comfortable for a much longer period of time. Agility. I already wrote about the ability to keep the weight low on the bike, which helps to maneuver the bike, but it also allows your body to become more agile. Bending and balancing over top of the bike is much, much easier when you don’t have extra weight on your torso. Those of us who have lost weight have undoubtedly experienced this when we pleasantly found it easier to stay on that technical, narrow trail after losing 5 or 10 pounds. Accessibility. It is much easier to get into a frame bag to access small, frequently used items while riding than it is in a backpack style bag. the openings are right there beneath and in front of you. Ventilation. While this one may not be realized as frequently in the winter as in summer, it is huge, especially where I live in San Diego. Allowing your back to breathe through your jersey by not having any pack against it will dramatically aid cooling and keep you feeling fresh longer than you would if you were trapping sweat between you and your Camelbak. I hope you find this MTB Tip of the Week useful. Many frame bags available these days have a hydration port that facilitates the passing of a hydration bladder hose through the frame bag and up to your handlebar cockpit area. You may need a hose extension kit, but most likely your LBS will have this available for you to purchase. Many of the frame bag builders are located in the USA and will custom make a bag for your individual bike. There are many all over North America, and there may be a frame bag builder very near to you. You don’t need to have a hardtail to enjoy the benefits of a framebag either. Many designs for full suspension frames are already in existence. Leave a comment below or send me an email at info@RideAlongside.com . Thanks for your support! Now get outside and find some trails to ride! This is Episode 3 in an ongoing series known as the MTB Tip of the Week. Its also known as the Local Bike Shop. Yes, my tip of the week is to visit your LBS. You may be asking, “Why is this a tip of the week?”. Well, let me explain by first putting forth a few scenarios that I have witnessed, regarding riders and their LBS. You may already visit your LBS weekly. You may visit a variety of Local Bike Shops in your area and “not play favorites”. You may be like many riders I know and shop wherever you get the best deal (including shipping of course) on the item you are looking for at the moment. You may have a LBS that has great service, but only stock products that are not at all what you use. So you only visit when you need help getting it back into optimal riding condition. 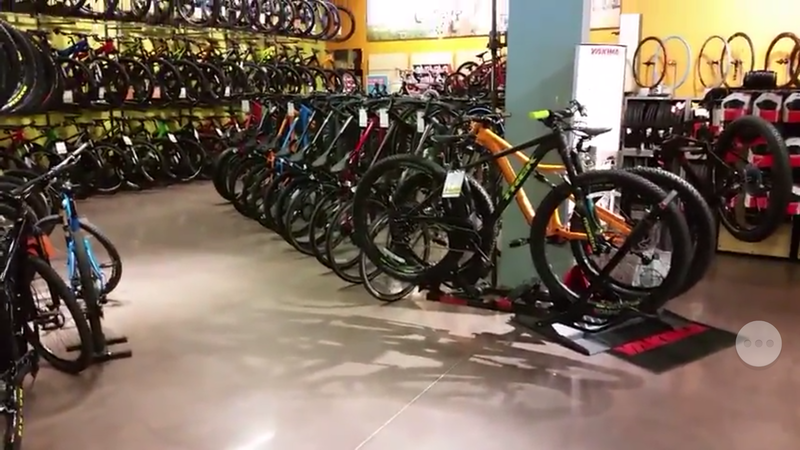 You may have a LBS that has great inventory of products at great prices, but you would never let them touch your bike because of the horror stories you have heard of about their service department. So you only visit when you have a part that you want to replace or upgrade. You may never visit the LBS in your area because shopping online is so convenient and you watch videos on how to fix your bike when you need service. If you haven’t been to your area’s LBS, you are totally missing out. The humble LBS is a beacon in the fog of local retail shops for those of us who ride the local trails. They provide the products and services that only riders like us are interested in. Many shops have put in serious time, investment, and analysis of what products and setups work best and are most highly desired for the local trails, paths, roads, and climate in your area. The owners, managers, and employees are well aware of the online shopping alternatives we all have access to and are usually willing to cut you a deal, price match, or do whatever it takes to ensure that you feel like you get a better deal from them. Just ask. The LBS has riders that work there and know the local places to ride better than many. These employees are often the riders that you have said hello to on the trail. Have them put on a helmet if you have a hard time recognizing them. 🙂 Also, asking what bike they ride makes the connection between who they are and where you might have seen them on the trail. Strike up a conversation with any of them about any cycling discussion to find out what they are about. You will often find another rider that you may end up riding with every week for years. I can tell you from personal experience that I wish I would have talked to shop employees much sooner in my life. If your area’s LBS doesn’t carry the products you want or need, let them know what those products are. They often will offer to special order them for you (a good majority of the products in a bicycle shop are ordered through the same distributors that all the other shops have access to). They will sell them to you at normal MSRP because they will not normally be aware of what other shops are selling those products for or they are not placing a large quantity order of that item. Have a genuine, honest, and open conversation with them about your wants and needs. They will probably work with you or even suggest another vendor that has those items. There are many shops that have decided to focus primarily on a particular niche in one area or another within the bicycling world. For instance, there are shops in San Diego that focus primarily on triathlon cycling gear. This should not deter you from entering into the type of conversation I mentioned above about your cycling wants and needs, even if you are strictly a downhill racer. Chances are that they would love to know what other cyclists in the area are into or if they are potentially missing a part of the market that needs a good LBS that caters to their side of the sport. They very well may direct you to another shop, even one that you potentially didn’t know about. Though you may be finding killer closeout deals online for some piece of gear that you could really use, seeing the items in person, especially those that need to fit well, is invaluable. Trust me. Anyone who has ordered shoes online, only to find that they didn’t fit right can attest to this. Its not only the fit however. By seeing, touching, and experiencing, in person, those items you will potentially buy, is more valuable than you may initially think. Sometimes you have to try the item out on the trail to find out however, which is why we try to provide our honest, and straightforward reviews here at Ride Alongside. There are some items that just plain fail, or need to be refined further, or are spectacular. Not only is it good to vote with your dollar as a consumer of those goods, but it is important to provide feedback to a Local Bike Shop to enable them to do so on a larger, wholesale bulk buy. This has a lot more power than you may realize. Sure, online reviews are good to some extent, but when you have a relationship with the manager at your LBS and they hear how great or awful a new product is that they are deciding to stock, they listen. It really can make the cycling industry better as a whole when you have a great relationship with your Local Bike Shop. Those are the reasons why this is the Tip of the Week. Thanks for reading all the way through this article, I really do appreciate it and could literally go on for quite a while longer about the value I have seen so far by developing a relationship with my LBS, but I will be learning more as time goes on and those relationships deepen, so a reminder and follow up article may be in our future, stay tuned. Many riders I know focus entirely too much on the bike they ride and/or where they ride it. Finishing off the discussion with Mikki from Revolution Cycles on Salsa Cycles Fargo vs Cutthroat and Deadwood. In this video, Nick gets the rundown on Mikki’s Salsa Fargo setup for mountain biking, commuting, and bikepacking. Mikki discusses his setup, what he plans to change and why those changes will better suit his application. Part 2 will discuss more on the Cutthroat model, how it differs from the Fargo and Deadwood as well as how it could easily be modified from bikepacking race bike to more of a comfortable commuter or a more generally capable mountain bike. Many thanks to Mikki from http://revolutionbikeshop.com/ for taking the time to discuss his rig with us. If you are ever in Solana Beach, CA make sure you stop by and say hello! The Trek Stache9 is a very capable 29plus hard tail trail bike with good geometry for aggressive riding on technical trails, minimizing the need to carefully choose exactly the right line. At the same time, the Stache9 excels in climbing since the rear wheel finds traction with the 29×3.0 inch Chupacabra tires on even the steepest and loosest terrains. Watch the video to hear more about our experience after testing the Trek Stache 9 midfat #plusbike hardtail on the trails in San Diego. A quick review after 6 months of hard riding and testing revealed a few issues. The main issue discussed here was indeed remedied by removing the screw, bending back the ratchet strap to a greater angle than could be achieved while the buckle was on the shoe in order to reach the point of clearing the release lip. Alternatively, I have read that others have successfully made a shim out of the aluminum wall of a soda can or very thin blade/screwdriver/etc. to slide beneath the ratcheting mechanism from the back, thereby inhibiting the ratchet tooth and strap interface where they then we’re able to slide out the strap. 4 bikes are looked at in this video, including one hardtail, two full sussers, and an electric full suspension bike. All with 275+ wheels, tires, and Boost hubs. Enter your email address to follow RideAlongside and receive notifications of new posts by email.